BTW, what’s a Perch Tird? Sounds like a funny story. This thread touched on the truth we don’t like to dwell on. The estimate about how many win in this game is 2-5%. How many of that percentage were people of little means who made it big with diligence and hard work? Maybe 2-5%? I hear a lot of guys making money that already had money. They lost $100,000 in the first year but they stuck with it and now they are doing great, or whatever. You can make money, if you have no money, by doing the zulu trade thing, or the collective2. Get a few hundred bucks a month for trading a demo account well and just keep loading that into your live account, that you are also trading. Some brokers have incubator programs that take successful traders and pair them with people who have money and you get a commission of the account. That will make you a millionaire pretty quick. But it comes back to trading like you already are a millionaire. Dream big guys and gals. We’ll make it an even 5% so it’ll include everyone in this thread. I guess it’s just something within you, a touch you have, and this is something non transferable from one trader to another…This is the key I’ve been looking for and apparently will never acquire. Retail traders do not impact the market due to having an incredibly small foot print with the money they use. Professional traders always buy low and sell high. When the majority buy price is pushed higher. When the majority sell price is pushed lower. GBPUSD and EURUSD are highly correlated. When we look at the SMT divergences between EURUSD and GBPUSD and we see GU making lower lows and EU making higher lows the reasoning for us to side with a buy for EU is because the professional traders would not be adding more sells to the GU. That would be selling low. Professionals do not sell low. It would be logical to assume that professional money was buying into EU because it was going higher. As professional money is buying into EU it is being pushed up, but because professional money is pushing price up it fails to make the same lower lows as GU. It is at this point where you see and OTE and SMT come together. This is when it matters because the OTE is created by the buying pressure it’s actually really strong evidence of a lot of money going in to buying it. If OTE is not accompanied with and SMT divergence what does it mean? Well it’s a good place to enter sure because of targets but you would be hoping that professional money will go in based on fibbs repeating in nature and because it looks like a nice place to enter. You don’t have any evidence to suggest it has done because you lack the SMT divergence. As is said in many of the videos: SMT used for conformation. I hope piphanger you read this and see reason in it. This trading is not all about faith, belief and blind following of systems without and understanding of why. ICT really knows how to trade and obviously has a life so has not been able to explain everything in extensive detail like a school teacher. So a lot of what he teaches I cannot use because I lack the understanding of why it works. But in time i’m sure i’ll learn more. Why something works is a vital question I have to have answered before I can follow something. I need reasonable and logical explanations for what is going on before I can believe it. OTE and SMT have this logical explanation. So I bloody love them! 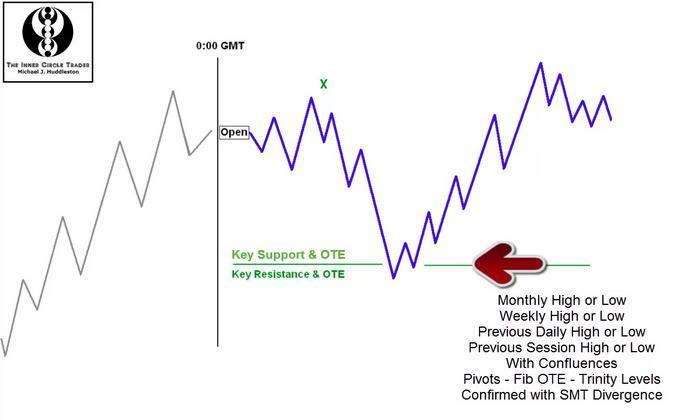 This is obviously a simplification but those time periods specifically LO are key points when trades are entered and where the days volume really begins. Seriously add the bar volume with right click properties. 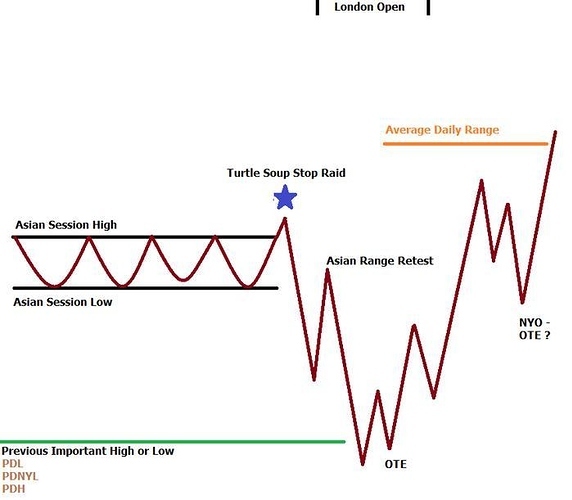 Have a look on a 1 hour chart at when every single day market volatility begins and ends. Its always LO and LC. Always without fail. Head to 4h charts and you’ll see the volume bars looking like saw teeth. I’m saying all this because i’m sure everything ICT teaches has sound logic behind it. If it didn’t he would be broke! Apologises if this has already been posted. bit offtopic, does anyone know which song or set is in this video? What hours I must use for London and NY in this indi? then I will have three zones at my charts? correct? Yeah asian can be put on too but I just use the other asian range bar indicator. Thats from 0000 to 0500 gmt. and these are times where ITC method is best to use? For day trading they all have their own specific requirements in different videos. LO is basically looking for entry in direction of you premise with OTE+SMT and what ever else you like. NYO Is looking for OTE’s to continue with SMT and what ever else. LO has its own whole entry approach. Heres a couple old pictures showing a london open set up. Wau great pics!! Many thanks!!! Is there any other logic beside Woolo’s explanation? To me it’s always better to have logic to make understand!! I found this great thread and educational videos recently. Michael, thank you so much to have spent your time to make those videos in order to share your knowledge and skills with us. I really appreciate it. So much information and so many things to learn and now I am very confused and lost where to start…or better to say how to start. Obviously, I cannot use them all together at once. As I have a full time job during London session and cannot trade during the day, my trading style is more like a day to swing trade based on 4H and Daily time frames. Could anyone please advise me what I should focus on from the videos? Kill zones are still important for me? Or …??? Hey woolo just wondering where you got those pics, i am trying to print them but it wont allow me to.